Yellowstone hasn’t erupted in about 630,000 years, and there’s no way to predict when it will happen again. It could be tomorrow, or it could take another million years. The point is, it will happen. Well, it will if someone can’t come up with a way to stop it. The NASA plan involves drilling into the caldera from sites outside of Yellowstone to gain access to the magma pocket that powers the supervolcano. That’s the dangerous part — a full eruption of Yellowstone wouldn’t kill that many people, but it would create a 500-mile wide ashfall with areas of the West and Midwest receiving up to four inches of ash. Total sunlight reaching croplands would be substantially (though temporarily) reduced. Assuming you can drill deep enough to open a channel to the supervolcano, you could use it to generate geothermal power. NASA’s plan calls for water to be piped through the volcano, which would emerge super-heated to about 662 degrees Fahrenheit (350 degrees Celsius). The steam could be used to generate power, but that energy doesn’t just appear from nowhere. It’s coming from the supervolcano, which would cool over time and lower the risk of eruption. Setting up this system would probably cost on the order of $3.5 billion, according to NASA estimates. NASA’s is considering this ambitious plan because of the extreme threat a supervolcano like Yellowstone presents. The Yellowstone Caldera has erupted three times in the past, and each of them has been orders of magnitude larger than the volcanic eruptions with which we’re familiar. There have been three eruptions in Yellowstone, the first of which occurred about 2.1 million years ago. It spread ash across much of North America and left a 50-mile wide crater in Yellowstone, which is now known as the Island Park Caldera. Supervolcanoes like Yellowstone can pump many cubic miles of ash into the atmosphere, which could alter global climate for a decade or more. These types of eruptions are extremely rare, but the Lava Creek eruption rated a VEI (Volcano Explosivity Index) score of 8, and covered a huge swath of the United States. To put this in further perspective: The eruption of Krakatoa, which destroyed an entire island, is ranked as a VEI 6 event. The most powerful eruption in the past 200 years was Mt. Tambora in 1815. This eruption kicked off what’s known as the Year Without a Summer, in which famine and wild temperature fluctuations occurred worldwide — and Tambora threw “just” 120 cubic kilometers of material. A Yellowstone eruption of comparable size to those we know happened 640 – 2.1 million years ago could be nearly 10x worse. The more recent Yellowstone eruptions haven’t been quite as large as the first, but any eruption in Yellowstone has the potential to cause widespread destruction. Working on ways to mitigate the danger is a good idea, even if it’s expensive. It would probably take many years to know whether NASA’s plan was just slowing the buildup of pressure or actually reversing it, and in the best case scenario, it would take thousands of years to cool the caldera completely. 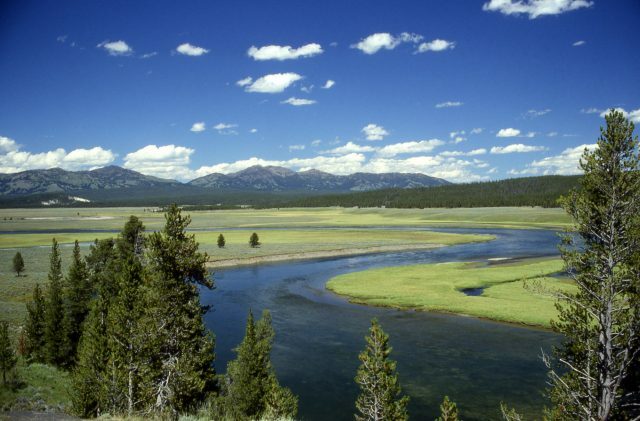 However, that’s thousands of years Yellowstone could power a large chunk of the US.